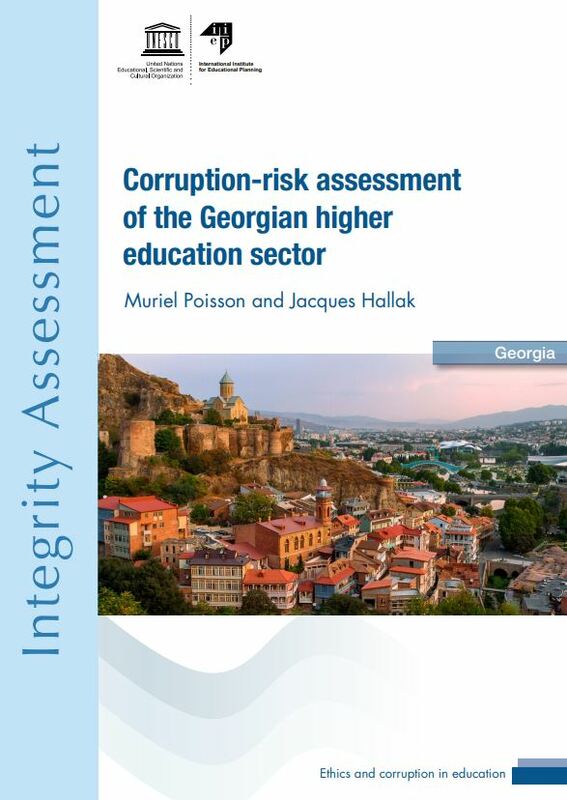 A new report from IIEP-UNESCO summarizes the findings of a corruption-risk assessment in Georgia’s higher education system and provides practical recommendations to foster greater integrity throughout the sector. At the request of the Prime Minister of Georgia, the risk assessment focused on financing, management of academic staff, and admission and exams. Corruption in education represents a major barrier to the achievement of the fourth Sustainable Development Goal (SDG 4). Identifying major corruption risks, as was done in Georgia, and the formulation of concrete recommendations to address such risks can help policy-makers and other key education actors overcome the burden of malpractice and misuse of often limited funds for improving the quality of education. The assessment consisted of a desk review of existing documentation on Georgia’s higher education system and in-depth interviews with the major higher education stakeholders in Georgia, from central to university level. The review team identified a series of risks associated with each of three domains analysed. These included risks related to research funding, hiring of staff and the definition of staff salaries and bonuses, admission to the universities, and private tutoring, among many others familiar to the university context. Promote public access to information in key domains (education programmes, course requirements, staff academic profile, budgets, etc.). In Georgia, there are 72 higher education institutions, including 20 public and 52 private ones. The vast majority – two-thirds – of the institutions are located in the capital city, Tbilisi. Muriel Poisson is a Programme Specialist at IIEP, in charge of the Institute’s project on ‘Ethics and Corruption in Education’. She is responsible for research and training activities in this area, on subjects including public expenditure tracking surveys, teacher codes of conduct, transparency in the management of pro-poor incentives, open school data, and academic integrity. Jacques Hallak is a former Director of IIEP. He has authored numerous books and papers on a diversity of subjects, including the costs and financing of education, the informal sector, school mapping, the challenges of international cooperation and, more recently, the fight against corruption in the education sector. He now works as an international consultant.